All mentors, parents/guardians and 21 youth gathered at the NWTF for a pizza dinner where they enjoyed a presentation of Turkey Hunting 101 and were introduced to their mentors for Saturdays hunt. 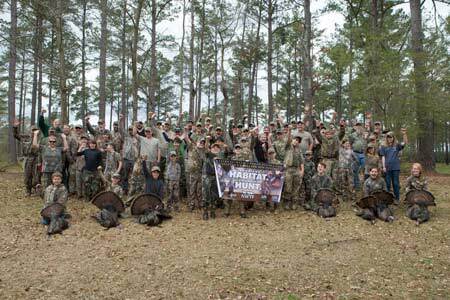 After hunting Saturday morning everyone returned to the NWTF for a Bar-B-Q lunch where the youth shared their “turkey tales”. There were 9 turkeys harvested and a lifetime of memories made. 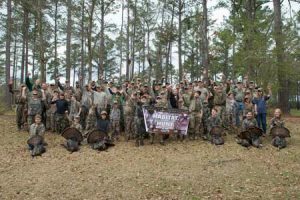 A special thanks to the land owners who provided property for the hunt, and to Dale Cullum for organizing the event as well as all the volunteers, mentors, and hunters who made the first “Mentored Youth Turkey Hunt” a huge success. 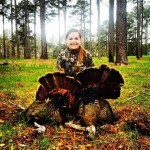 Jordon Baker, 13 years old with her first turkey. 16.5 lbs, double beard gobbler. Mathis Butler, 9 years old with his first turkey. 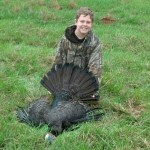 17 lbs, double beard, 1″ spurs. Susannah Hammond, 16 years old with her first two turkeys. 15 lbs and 16 lbs.